Because he aided in removing victims of a bomb explosion at an Algerian base despite danger of further blasts, Lieut. Patrick J. Vesey, whose wife is the former Wilma Hansen, 1422 Court Street, has been awarded the soldier’s medal, the war department announced Sunday. Lieut. Vesey was one of 22 officers and enlisted men to receive such medals as the result of their heroism during the incident, which occurred June 36 at a base under the command of Maj. Gen. James H. Doolittle, commanding general of the northwest African strategic air force. "The heroic action and valiant work continued until they were forced to withdraw by superior authority. The heroism, valor and courage in the face of danger reflects great credit upon themselves and the armed forces of the United States." 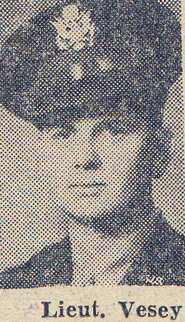 Lieutenant Vesey formerly was stationed at the Sioux City air base.